Shirts With Random Triangles: Tennessee Adds CB Prospect Baylen Buchanan To Its 2016 Recruiting Class. 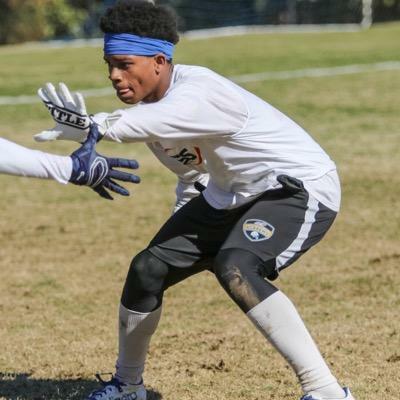 Tennessee Adds CB Prospect Baylen Buchanan To Its 2016 Recruiting Class. Baylen Buchanan. Image via sportstalksc.com. The latest commitment to Tennessee's 2016 recruiting class comes with an NFL pedigree. Suwanee, Ga. high school senior cornerback Baylen Buchanan committed to the Volunteers on Friday. Buchanan is the son of former NFL defensive back Ray Buchanan. The elder Buchanan played 12 seasons in the NFL with the Indianapolis Colts, Atlanta Falcons, and the Oakland Raiders. 247Sports grades Buchanan as a composite three-star cornerback. The recruiting website ranks Buchanan at no. 59 among CB prospects for 2016, at no. 64 among 2016 prospects from the state of Georgia, and at no. 685 in its composite rankings of 2016 prospects nationally. Buchanan attends Peachtree Ridge High School in Suwanee, Ga. He stands 5'11, and weighs 188 lbs.